The PS1000 is a versatile floor scale for a variety of weighing applications, including shipping and receiving, livestock, bulk containers, feed carts and pets. 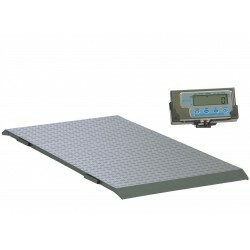 Weighing only 60 lbs, two easy access carry handles makes this scale convenient to relocate. No need for ramps or recessed floors, as this unit comes with ramped ends. The PS1000 is very accurate, providing consistent accuracy within 0.1% and comes equipped with an indicator for fast digital read out. It is also very economical to own, as there are no installation costs and no moving parts that require maintenance or adjustment.